Our Software and Informatics Research Centre (SIRC) accommodates the university’s need for new spaces for research, study and future active learning. • Flexible learning spaces featuring multiple seating configurations, room divisibility and the newest audio-visual technology. • Approximately 280 square metres of student study space. • Engineering labs in electronics, mechatronics, and robotics as well as a design/makerspace featuring 3D printers, and soldering and electronics stations. There are many ways for individuals, companies and foundations to support the work of our students and researchers in this new facility. Find out how you can support SIRC. 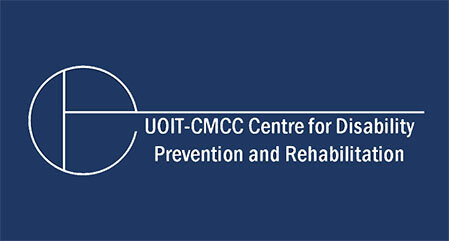 For more information on the project, please contact us at sirc@uoit.ca. November 2, 2017 – The university celebrates the official opening of the building. September 2017 – The Office of the Registrar relocates to the building and the first two floors open to students. October 13, 2016 – The Government of Canada announces an $11.8 million investment in the university through the Post-Secondary Institutions Strategic Investment Fund. The Province of Ontario announces a $1.2 million investment in the university through the Building Ontario (BuildON) infrastructure investment program. 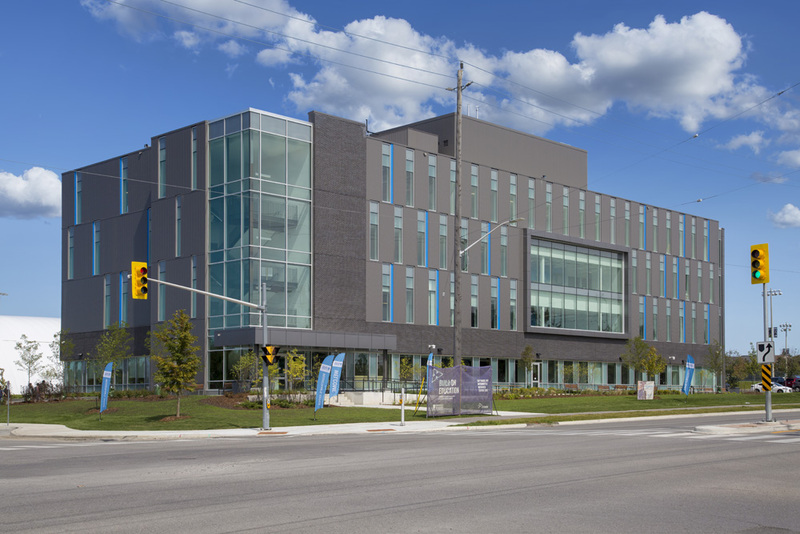 June 29, 2016 – University of Ontario Institute of Technology Board of Governors approves next phase of SIRC development, and authorizes start of construction at the northeast corner of Conlin Road and Founders Drive. The overall project is valued at $33.5 million. May 9, 2016 – The university submits an application to Canada’s Post-Secondary Institutions Strategic Investment Fund. 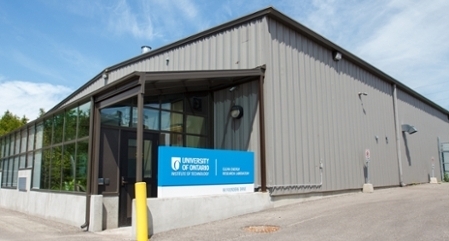 February 2016 – The university releases a request for proposal (RFP) to create new learning space at the north Oshawa campus location. The building is located on the northeast corner of Conlin Road and Founders Drive, on the site of the Founders 3 parking lot. SIRC is a four-storey, 7,600 square metre space – slightly smaller than the Energy Systems and Nuclear Science Research Centre (ERC). The advanced research facility accommodates the university's need for new spaces for research, study and future active learning. SIRC promotes interdisciplinary approaches between computer scientists, IT specialists and engineers by clustering the university’s expertise in health and business analytics, IT security, networking, gaming, and software engineering. What facilities are located in the new building? The university has planned this new building with the future in mind. While the new SIRC building will feature four-storeys, only the first two floors opened in 2017. SIRC, level 1 and 2, are home to three Faculty of Engineering and Applied Science labs: 1) mechatronics/robotics, 2) electronics and 3) an Innovations/makerspace lab featuring 3D printers, and soldering and electronics stations. Most equipment will be mobile to facilitate interchangeability among labs. The Office of the Registrar condensed its operations from five locations into a single location in SIRC (a move that uses 22 per cent less space than present). This helps the university use space more efficiently and frees up student space in existing campus buildings. Levels 3 and 4 will include additional teaching, research and innovation spaces into the SIRC building's upper floors as new funding or research opportunities become available, without the need to build another structure. Is this building the same as the Centre for Advanced Research, Innovation and Entrepreneurship that was announced last year? No. CARIE is a separate project. The SIRC building is the university’s immediate priority, and the university continues to work on the development of CARIE with its federal and provincial partners. What happened to the existing parking lot at the corner of Founders and Conlin? As part of the SIRC project, a new parking area (Founders Lot 5) was created north of the Campus Ice Centre, just off Simcoe Street north of Conlin Road. How does SIRC fit with the new Campus Master Plan? SIRC creates the first new learning landmark at the university’s north Oshawa campus location, and sets the stage for future development of the Windfields Farm lands. The new building follows the growth philosophy expressed in the university’s Campus Master Plan. EllisDon was the general contractor for the project. 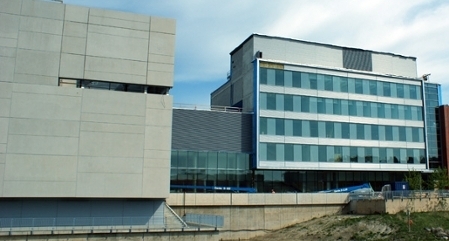 EllisDon constructed the university’s first three buildings at the north Oshawa location: the Science Building, the Business and Information Technology Building, and the Campus Library. Who was the architect for SIRC and what are some of the building’s environmental considerations?